This month the annual Buddhism festival was held in Museum Volkenkunde in the University city of Leiden, The Netherlands. I was asked to offer thangka painting demonstrations, several Buddhist Art workshops, as well as a guided tour at the Tibetan section of the museum, where I spoke about the 18th century thangka of Mahakala, one of the museum’s masterpieces. 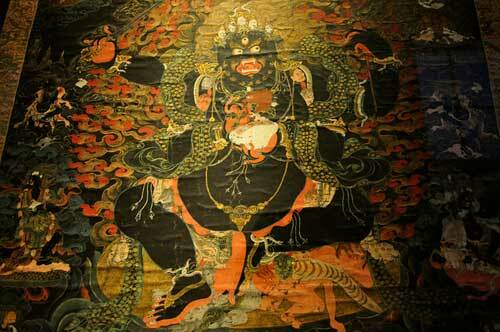 This buddhist scroll was painted in Tibet between 1750 and 1800. Mahakala is one of the Eight Dharma Protector deities, and therefore this beautiful artwork was part of a collection of 8 thangkas. Despite his wrathful appearance, Mahakala is a manifestation of Avalokiteshvara, the embodiment of the Great Compassion of all Buddhas. 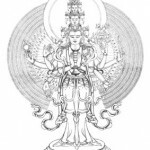 Once Chenrezig (Avalokiteshvara’s name in Tibetan) realized that the methods he used were too mild and peaceful to subdue all beings in this age of darkness and degeneration, and to protect them from the consequences of their misguided behavior, he decided that in a ferocious form he would be better able to accomplish the compassionate intentions he had.